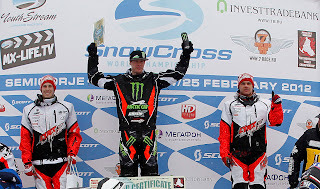 Semigorje, Russia (February 25, 2012) – America’s Tucker Hibbert rode with determination on a challenging racetrack to win his second FIM Snowcross World Championship title in front of 12,000 screaming Russian fans. Tucked into the deeps woods of the Ivanovo region over 400 km northeast of Moscow, the Technical Sports Centre Semigorje featured a long, rough racetrack where 33 riders from six countries battled for the 2012 World Championship title. Hibbert won his qualifying race giving him the number one starting line pick for the three 15-minute, plus two laps main events. In the first main, he got a quick jump off the start but pulled his tether from his snowmobile in turn one, killing the engine. By the time he got going, he was already shuffled to the back of the 22-rider field. He refocused and put on one of the most impressive charges of his career. By lap two, he had already moved into ninth place. 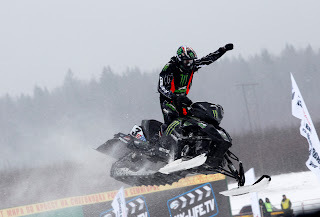 He spent the remaining time picking off more riders to finish an impressive second place behind Sweden’s Peter Narsa. 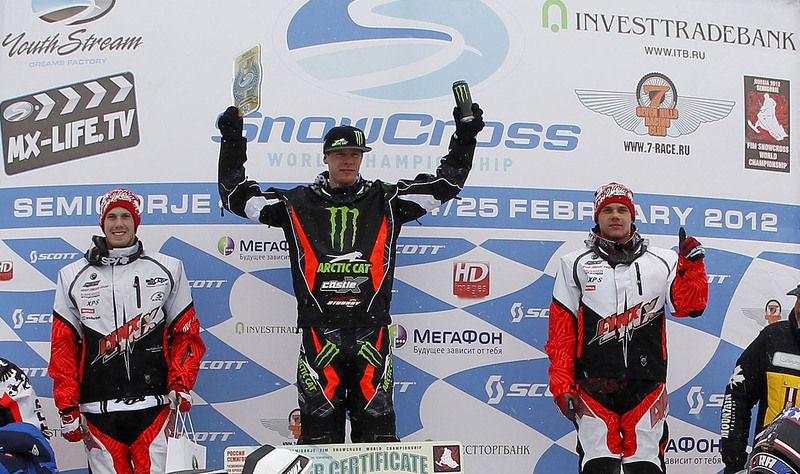 Hibbert took the early lead in the second main event and rode flawless for the win. In the third and final main of the day, Hibbert got a mid-pack start with Narsa leading the charge. He quickly moved into second and began chipping away at Narsa’s runaway lead. The crowd went wild when he made the pass on Narsa in a big, bermed left-hand corner at the halfway point of the race. Once in the lead, he pulled a sizeable gap then raced smart to secure the 2012 title. This was one of the most challenging race situation I’ve ever been in. We (the team) worked hard for this one and it feels great to come out on top. The track was awesome. It was exciting to race on a long track. It had a good mix of rough rhythms, high-speed sections and big jumps. It got extremely rough. The whole day was a crazy mix of race situations. I was able to conserve energy and my sled by cruising to the win in my qualifier and the second main. The first and third mains were a different story. I didn’t know what would happen in the first main after coming around the second corner in dead last. I had to charge hard to get through the pack to finish second. In the third main, I had to ride really hard too because I knew I had to pass Narsa for the lead to be able to win the World Championship. It was cool to see the excitement and intensity of the fans in Russia. Every time I rode by a spectator area, I could here them cheering! We (the team) worked hard to come into this race prepared. After finishing third last year, it was important to work hard and win. There were so many people behind the scenes that made this whole thing possible. Racing is a team effort and I’m thankful for all the hard work that went into me being able to travel to Russia and win the World Championship!